My first wife left me a green glazed brush pot when she died. I believe it was left to her by her great-grandmother who brought it to the US in the mid-19th century. The raised decorations depict a man riding a water-buffalo reaching for his hat as the wind carries it away. Raised script on the side of the pot suggest a lyrical song. I am enclosing pictures of the pot and the 6-figure, non-framed marks from the bottom of the pot. I am trying to determine the age of the pot and an estimated value. Thank you for any trouble you may go to on my behalf. This pot is indeed a Chinese brush pot, called in Chinese, a "bitong. This type of raised decoration occurs on Chinese porcelain from the Qianlong period and maybe even slightly earlier then that, but I don't have any references at hand for to look into, for the earliest date. This kind of decoration becomes very popular during the mid 19th century and later though and there are several artists specializing in this kind o f wares that are quite interesting too look into. 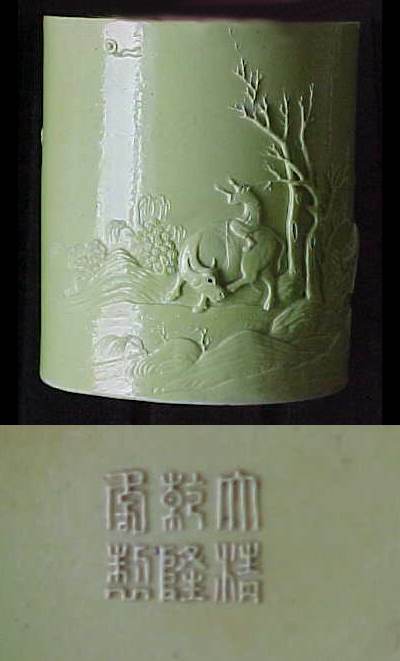 The mark says "Da Qing Qianlong Nian Zhi" which translates "Great Qing Dynasty Qianlong period made". Now, I don't believe this is the case, since the mark is written in a distinctly different way than the marks were written during the Qianlong (1736-1795) period. This type of decoration was also made popular during the first decades of the 20th century by a famous porcelain artist called Wang Bing Rong and this is also the period I would suggest as a date for this nice brush pot. Now I rarely suggest any prices for anything, but could suggest that the price levels should be in the area of a number of hundred US $ to maybe several thousands to give you something to base your further research on. If the Bitong had been Qianlong period or a signed "Wang Bing Rong" suggesting a price level would have been much easier for me, so I would like to seriously suggest you to consult with any of the major international auction houses for an opinion on this, and don't necessarily go with the first opinion you get. This is a nice piece and might bring a nice price.